T-Mobile said nearly one year ago that it would build out its 5G coverage in 30 cities in 2018, and now the carrier has confirmed that it achieved its goal. T-Mobile says that it has launched its 5G service in 30 cities, confirming the news to LightReading. However, it’s not actually offering that service to customers just yet since it doesn’t sell any smartphones that can actually get on the 5G network. T-Mo recently confirmed that it’s working on a 5G smartphone from Samsung and that it’ll have multiple 5G devices available in 2019. When it announced plans to launch 5G coverage in 30 cities last year, T-Mobile said that the first group of cities to get its 5G service would include New York City, Los Angeles, Dallas, and Las Vegas. Right now T-Mobile isn’t saying much more about its 5G network other than the fact that it’s live, though. That means that we don’t know all of the cities that have it or how widespread the coverage currently is. What we do know is that T-Mobile plans to use a combination of 600MHz and millimeter wave (mmWave) spectrum for its 5G network. We also know that T-Mobile plans to have nationwide 5G coverage by 2020. Right now, 5G is still in very early days, with Verizon offering limited 5G Home service and AT&T launching mobile 5G in parts of 12 U.S. cities but with only a mobile hotspot that can access it. All that said, we are inching closer to seeing mobile 5G service roll out, which is pretty exciting. We should see much more news about 5G networks once the first 5G smartphones begin launching later this year. Rumors have suggested that Samsung is working on a 5G version of the Galaxy S10, and today a report claimed that that device’s specs could include a 6.7-inch display, 1TB of storage, and a 5000mAh battery. 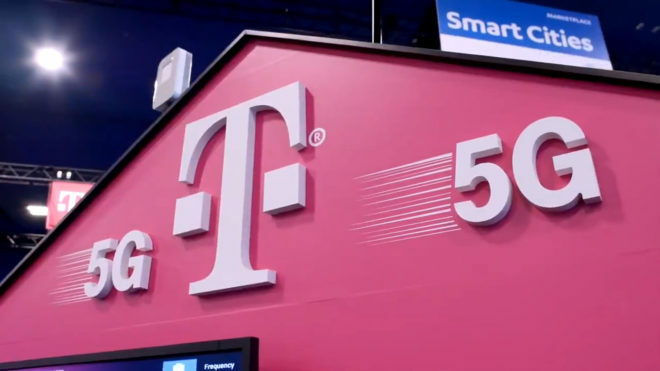 UPDATE: T-Mobile has clarified to me that while its 5G network is actively being built out in 30 cities, it won’t technically launch until 5G devices are available. Thought the LGv30 was suppose to be 5g ready? That was a combined announcement of the V30 being the 1st phone to be compatible with Band 71 & the ramping up of the upcoming 5G network effort. Two separate items,but,it seems a bit misleading to put the two together in the same announcement. V30s are nice phones and the Tmo version can be bought for $250 – $350. I got one for $289 last month and it is legit. If you do ebay make sure it is the Tmobile model H932 and make sure the vendor has a decent rep. Don’t buy an international version – that is only good for Europe and Korea. We wait for the two for one, without an extra line deals now. No reason to spend so much on a brand new device when you can get it for half price a few months later. I have taken advantage in the past. Plus Tmo changed the rules. Before you had to get a new line, and they gave you the discount right away as a gift card and then drop the line a month or two later. Now they give it to you over 24 months, and if you stop your line – you don’t get any more rebate – that makes the twofer’s less palatable. No, there are zero current phones that can support 5G. Zero phones on the T-Mobile network. The Z3 has a 5g mod for Verizon. Eh, splitting hairs. It is not currently 5G capable. It will be able to do 5G maybe sometime in the future (no release date is even set) with an external device, still in prototype, that you have to buy separately and hangs of the back the back of your device. It’s not really much different than AT&T’s 5G hotspot at the end of the day. The LGv30 isn’t even Android Pie-ready, and there are no plans for it to be in the near future. It is a good phone and all, and works fantastically well on all the Band 71 here that is blanketing western Kansas & Oklahoma, but no OS updates in the year since I’ve had it??? C’mon, that’s just ridiculous by any standard. You expect everything in life for free? No, just a frinkin reasonable price! Considering we are now at the end of the decade, and these manufacturers want $700-$900+ for a smartphone, and will only be offering 128GB for all that $ is just crazy, the more money someone soends, they more demanding people tend to be! 600 – 700 every 2.5 years is about my limit. These high end phones have gone bonkers on price. I am now a high tier mid range buyer I guess. We can all thank Apple for these prices. If it hadn’t been charging far more than what things actually cost, thereby artificially rising the ceiling of what things are worth, then other companies would have never have thought they could get away with doing the same. One plus 7 should be 5g and is expected to be 700 I love my 6t. Heck, even $1,200 is crazy, even if it has 1TB of storage!!! I hate how manufacturers use increased storage space as an excuse for oversized increases in price, often more than 5 times what it actually costs. Tweeted to John, Mike, Neville and TMobile. Told them I want to sign up for 5G Residential Fixed Wireless. I’m in the greater Los Angeles area. Hope I hear back. Perhaps a Beta Tester. A List of the 30 cities is where exactly? Been looking and it’s nowhere to be found at any of those sites or this one. I guess AT&T wins. For those who want 5G now, a hotspot is better than nothing. In some areas tethering 4g is good enough. While my current apartment is the pits there are places where I could hotspot / tether and not have to get cable. Note – the best speeds tethering has been about 20mb/s – because I think it is somewhat throttled – but that is enough to watch Netflix on my computer. Tethering takes up resources on your phone so you’ll never see the same speeds as simply using the phone itself. Interesting – but still enough to watch a movie while browsing web pages. Asus actually makes a few WIFI routers where you can tether the phone right to the router than use the tethering for all your hoise devices. True that 20Mbps is often good enough for certain uses. There are more manufacturers than Asus that make router’s that can share a WiFi connection, not always easy to set up though. If you have a 10GB of tethering then I assume you have Simple Choice Unlimited. If that’s the case then you can turn Binge-On on and your video won’t count towards your limit, although your video would then be in 480p. I do this during power outages (we have a generator and T-Mobile never goes out during power outages in our area) so I can Chromecast Netflix without running out of data. There may be other routers, but with ASUS it is built in, and it is easy to set up. The other routers I found that can do it, require you flash them with a custom firmware. I got my 10GB when they had a special promo on the One line. I didn’t realize Binge-On cut video quality on tethered/hotspotted devices. I will experiment if Tmobile ever gets me more than 0.16mbps at my current apartment. But for that fact that real world tests show the virtually unused 5G network performing WORSE than the 4G network. How soon when 5G will replace wire internet? Wireless will never replace wired internet. Wired will always be superior in every way. Yes, wired internet will be super. It’s possible to more bandwidth in wired communication. Umm, have you traveled 3-5 years into the future? Lol…5G is going to be capable of GIGABITS!!! Truth is, can’t even begin to imagine how much 5G will change our lives!!! Don’t forget that the wired internet is carrying all the wireless data, which is a tiny minuscule of ALL data that is actually flowing on the internet. The wireless portion is only between your phone radio and the cellular site(s). I would bet most cell sites are are served by microwave towers. Yeah eventually it goes to a cable but not as soon as you think. And wired will always be able to provide better speeds, capacity, and latency. A huge drawback to wireless is that the airwaves are a shared resource. Anyone using WiFi in an apartment can attest to this. The only thing stopping me from dropping DSL is I go through 150GB a month. Wow, that’s terrible. Nearly all cable is “gigabit” and offers an “unlimited” option in my state. Just because a cable provider doesn’t want to keep up with technology doesn’t discount the fact that wired is and always will be the superior technology though. A 5G offering would likely force your cable provider to offer real speeds. For the last mile it sure looks like it will. DSL and Cable can’t compete against 5G in speed, latency, or cost. I’m so ready to cancel my landline carrier. I think it depends on the implementation. LTE though it has higher latency is already better than all DSL. It may always be superior, but there will come a time that the differences are negligible and wireless will be the go-to. The issue with wireless is that as the speeds and bandwidth improve with efficiency, all kinds of services and features begin operating on the network, thus exposing its limitations. When 4G was launched, video streaming wasn’t a thing. Even now, if we restrict video to maximum 720p, 4G alone would be able to handle it ! At least from a bandwidth perspective. I am not sure what good higher pixel density does on a tiny screen unless people have eyesight like birds. Everything is a marketing gimmick- device screen size and resolution, nG, camera (they expect professional quality cameras in a pinbox phone camera then why do SLR cameras sell for thousands ?). Having said that, if 5G lives up to expectations, we can have one wireless standard and it could be adopted on ALL devices, not just devices with small screens. For a list of cities? The ones we’re not in or near. Guaranteed. Well, yeah. With only 30 cities you’re not likely to be in a coverage area, has nothing to do with T-Mobile. Eons? It took only 6 months after the initial flagships came out (which came out right after band 71 deployment began) for a plethora of low and mid range devices to come out. Nah, only “some” flagships and subpar phones…and all came out agonizingly slowly… The only exception is finally now the 6T, and there’s nothing a notch below it that doesn’t suffer from locked bootloader, underwhelming screen size, resolution, and/or storage. I realize it’s only my opinion / small phones are ok for many. I would be more excited about 5G if I knew for sure that carriers would abandon the throttling and so called video optimization. I have it how they cripple the service to try and extract more money out of you. Well!!! If LTE is implemented fully, as in tri-band/quad-band carrier aggregation, on each and every cell tower, there is no reason capacity can’t be much higher. People regularly underestimate future internet usage and needs. More likely than not 5G won’t live up to the hype either. At least T-Mobile is the first to actually roll out a true, fully nationwide 5G network since it is in New York City and Los Angeles. This is a huge feather in T-Mobile’s cap. 30 cities isn’t nationwide coverage, that’ll come in 2020 which may make them first. I agree that it is not really “nationwide” coverage, but to the carriers and their PR departments it is. They have in the past claimed nationwide coverage for previous generations of technology with far less than this 30 cities, so it isn’t a stretch at all if they start to claim it now. It is the same as with AT&T and their 5Ge lie. If they want to get technical with it, I would postulate that there are no carriers right now that should be able to claim nationwide service in regards to any technology. None of the major carriers currently have any native coverage in Nebraska for some odd reason, or very little at the eastern edge. Only local and regional carriers such as US Cellular, United, and Viaero blanket the state and the major carriers roam on them. “Nationwide” should be nationwide, every state, or “continental US” if they want to omit Alaska and Hawaii. It’s great to know that New York is aboard in the first group of cities for 5G for T-Mobile. Now I have to wait on the Galaxy Fold between March 29th and April 20th. Since the Galaxy Fold will be shown privately at the S10 event on February 20th I’ll take that 6200mAh battery for sure. Note10 will also arrive in my rotation for 2019 along with the Galaxy Fold. Can’t wait to add it to my Note9, OnePlus6t, and Revvl2Plus. Wow 1Tb?! I have 512Gb on my iPhone and I’ll never even use that! Then you were foolish to pay an outrageous amount for storage you’ll never use. “Foolish”? The difference in cost is a nice dinner for something I’ll use everyday for a year. Not really a big deal. Not following you. You said you had 512gb and will never use it then responded you’ll use it daily which makes no sense. It’s your money, I get that, but why buy 512gb if say 256gb was enough? I’m not trolling, serious question. That $150 dollar upgrade I’m sure you could have put to better use. No matter though, you’ll never need more storage so that’s a good thing. No, I probably won’t ever need 512Gb. But I will use the phone everyday so for $150 why not have the top of the line? Some people think Apple products are over priced, other people think you get what you pay for and are happy with their pricing. There’s no right or wrong, the real question is what’s right for any given individual. I’d love to have 1TB of storage. What I find strange is the 6.7″ screen. That’s pretty much a tablet. 5G is currently deployed but not active on T-Mobile because there are no 5G devices available (phone manufacturer issue, not a network issue). Only AT&T has 5G devices available and that’s only a hotspot. 5G won’t really be a thing until 2020. Tmo said 5G is LIVE in 30 Cites !!! I don’t think Samsung has much of a future in phones. The Chinese manufacturers are going to take all the margins out of Android devices… Samsung can’t compete and still make money. Apple is lucky they’re in a good position because they don’t have to compete with anyone. You know as much as a camel in the sahara about the phone industry. I have just decided that if 5G phones cost more than 4G LTE then I’m not switching to 5G. I’ll switch to a cheaper carrier like Google Fi!